This is it, the final competition of the “Save Your Strings” Competition, in which OurStage and Ernie Ball search for three artists – from the Pop, Rock, and Country genres – to win a year's supply of strings and accessories. And ONE of those artists will win the GRAND PRIZE: An Ernie Ball endorsement and Music Man guitars for EACH player in the band. We've picked the winners from Rock and Pop already. Are you ready for the Country? Enter your best country song in the Ernie Ball "Save Your Strings" Competition by December 23rd for a chance to win. OurStage fans will rank the best entries, and Ernie Ball will select a winner. Get to it. In January 2014, Ernie Ball will select the Country Prize Winner, as well as the Grand Prize Winner from among the three genre winners. 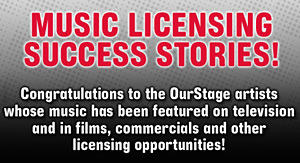 *Only submission materials that are determined, at the sole discretion of the Sponsors, to be classified as Country or Alternative Country, as defined on the OurStage FAQs, will be deemed valid entries.